Kidney cancer, also known as renal cancer, affects over 12,000 people every year. Most people who get kidney cancer are over 60, and it affects more men than women. Kidney cancer starts when cells in your kidney grow in an abnormal and uncontrolled way. Usually only one of your kidneys is affected by cancer. But the cancer can grow out of your kidney and spread to other parts of your body. This topic is about the most common type of kidney cancer – renal cell cancer (RCC). There are several types of kidney cancer. Renal cell cancer (RCC) is the most common type in adults. More than eight out of 10 people who get kidney cancer in the UK have this type. In RCC, the cancerous cells develop in the lining of tubes inside your kidneys. These tubes help to filter your blood and make urine. Renal cell cancer is divided further into subtypes, depending on the type of cell the cancer starts in. The most common subtype is called clear cell renal cancer. There are several other types of kidney cancer. These include the following. 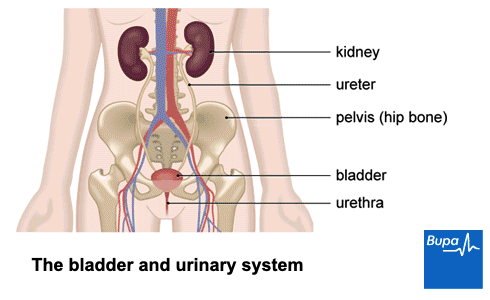 Transitional cell cancer (TCC) affects the part of your kidney called the renal pelvis, where your urine collects. About seven or eight out of 100 people who get kidney cancer in the UK have TCC. Wilms’ tumour is a rare type of kidney cancer that can affect children, most often those under five. Only about 80 children develop Wilms’ tumour each year in the UK. This topic is about renal cell cancer. In the early stages of kidney cancer, you probably won’t have any symptoms. As the cancer grows, the most common symptom is blood in your urine. It’s possible that you might feel a lump in your back or side, and have some pain here too, although this is uncommon. Most kidney cancers are too small to feel. If the cancer spreads, it can cause symptoms in other parts of your body (for instance, coughing up blood and pain in your bones). There are many other things that could cause these symptoms. But if you’ve been having symptoms such as these for a while, it’s important to discuss them with your GP. Many people with kidney cancer only find out they have it by chance, for instance if they’re having tests or scans for other reasons. Other people are diagnosed after they go to their GP with symptoms, such as blood in their urine. If you see your GP, they’ll want to ask you about your symptoms and examine you. They will probably ask you about your medical and family history too. Your GP may test a sample of your urine with a dipstick to check if there’s any blood in it. They may also need to take a sample of your blood to test. Your GP will want to check whether or not you have a urinary infection that could be causing symptoms, such as blood in your urine. If you have, they will treat this. If your GP thinks your symptoms could be due to kidney cancer, they’ll refer you to see a urologist. This is a doctor who specialises in diagnosing and treating conditions affecting the urinary system. If you’re aged 45 or over, you should be offered an appointment with a specialist within two weeks – although this may not always be possible. You’re likely to be offered a scan of your kidneys when you’re referred to a urologist. Your urologist will use the scan to confirm whether or not there is a cancer. You may be offered one or more of the following. CT scan. This uses X-rays to make a three-dimensional image of your kidneys and other organs. Ultrasound scan. This uses sound waves to produce an image of your kidneys and can show any growths. MRI scan. This uses magnets and radio waves to produce images of the inside of your kidneys. If these tests find that you have kidney cancer, you may need further tests, to find its size and position, and if it has spread. These tests may include scans of your bones and brain. This is called staging. Your doctor may also want to take a biopsy (sample of cells) from your kidney. Surgery is the main treatment for kidney cancer that hasn’t spread outside your kidney. If you’re diagnosed with kidney cancer when it’s at an early stage, there’s a good chance that surgery can cure it. You can have open surgery, in which your surgeon will make one large cut in your abdomen (tummy). Or you may be able to have keyhole surgery. If you have a small or early-stage tumour, it may not be necessary to remove your whole kidney. Your surgeon may be able to just remove the affected part of your kidney. This is called a partial nephrectomy, or nephron-sparing surgery. Your surgeon may also suggest this if you only have one kidney, or your other kidney isn’t working properly. For larger or later stage tumours, your surgeon may need to remove your whole kidney and nearby lymph nodes. This is a radical nephrectomy. For more information on having a nephrectomy, see our FAQ: Living with one kidney. If your tumour is particularly small, or if you aren’t healthy enough for surgery there are other procedures that you may be offered. You have these treatments in specialist cancer hospitals. They include the following. Percutaneous radiofrequency ablation. This involves using a probe to apply radiofrequency energy to your cancer. This heats the cancer cells and destroys them. Cryotherapy. This uses liquid nitrogen, passed into the cancer via needles through your skin, to freeze and destroy cancer cells. If you have advanced cancer that’s spread outside your kidney, you may still be offered surgery because it might help with your symptoms. But you’ll also be offered other treatments to try and control the cancer and relieve your symptoms. Targeted therapy (also called biological therapy) uses medicines that interfere with how the cancer cells work, destroying them or stopping them from growing. Your doctor may offer you targeted therapy if your kidney cancer has spread, or after surgery to help kill any remaining cancer cells. Targeted medicines include the following. Tyrosine kinase inhibitors. The most commonly used ones include sunitinib, pazopanib and sorafenib. You take these medicines as tablets, and they work by stopping the cancer from growing. Interleukin-2 (aldesleukin). This is a type of synthetic (artificial) protein that’s given as an injection under the skin. It’s only suitable for a few people with advanced kidney cancer, who are otherwise in good health and whose cancer hasn’t spread much. It works by shrinking the tumour. Interferon-alfa. This is a type of immunotherapy. Interferon-alfa is an artificial version of a naturally occurring protein in your body. It plays an important role in boosting your immune system. Interferon interferes with the way the cancer cells grow and multiply, as well as stimulating your immune system to attack the cancer. It’s given as an injection under the skin, and is normally used in combination with another drug called bevacizumab. It’s only suitable for a very few people. Radiotherapy uses radiation to destroy cancer cells. It isn’t used much in kidney cancer but your doctor may offer you this treatment to shrink your cancer if it’s causing you pain. You may also have it to treat and control pain from cancer that has spread to other parts of your body. take certain over-the-counter painkillers regularly or for a long time – for more information see our FAQ: Painkillers and kidney cancer. Making some changes to your lifestyle may help to reduce your risk of getting kidney cancer. The following measures will help to improve your health in general,and reduce your chance of getting kidney cancer. Stopping smoking. If you smoke, you double your risk of kidney cancer. The longer you’ve been smoking and the more you smoke, the greater your risk. Losing weight if you’re overweight or obese. Being obese is thought to be linked to around a quarter of all kidney cancers. For tips, see our information on losing weight safely. Eating more fruit and vegetables. It’s possible that a diet with lots of fruit and vegetables might help to protect you from developing kidney cancer. While studies on this have had mixed results, eating plenty of fruit and vegetables, is good for your health generally. You may well feel shocked, upset or scared when you’re first diagnosed with kidney cancer. It’s perfectly normal to have a range of emotions, and everyone reacts differently. You may find that talking to family or friends can help or you may prefer to talk to someone outside of your family. Organisations and support groups can help with emotional aspects as well as any practical issues you may be concerned about. See our Other helpful websites section for details of organisations and support groups that you can contact. Do over-the-counter painkillers cause kidney cancer? Do over-the-counter painkillers cause kidney cancer? Some studies have suggested there may be a link between taking certain over-the-counter painkillers and developing kidney cancer. These painkillers include paracetamol and non-steroidal anti-inflammatory drugs (NSAIDs) – such as ibuprofen. Research looking into this link is still ongoing, but it’s only likely to be an issue if you take a lot of these painkillers over a long period of time. It’s unlikely to be harmful if you only take painkillers occasionally, or take a low dose. If you take painkillers regularly and are concerned about your risk of kidney cancer, speak to your pharmacist for advice. What is my chance of surviving kidney cancer? What is my chance of surviving kidney cancer? Your chance of surviving kidney cancer and how long you may live with the disease depends on many things. These include how early your cancer has been caught and if it’s spread, how old you are and your general health. Although statistics are available that can give us a general idea of your chance of survival, it’s impossible to predict for any individual person. If kidney cancer is diagnosed at an early stage, there’s a very good chance of surgery being able to cure it. More than eight out of 10 people with the earliest stage kidney cancer survive for five years or more after they’re diagnosed. Many people live for much longer than this, but this is the time period scientists often use when talking about survival from cancer. It’s harder to treat cancer that’s spread outside the kidney, and the survival rates are lower for these cancers. But newer treatments that have become available over the past few years have made these cancers easier to treat, and the survival rates are continuing to improve. Remember that new treatments are being tested and developed all the time. These may be able to help you if you’re diagnosed with advanced kidney cancer. If you’re worried or have questions about your chance of survival from kidney cancer, it’s best to discuss this with your doctor. They will be able to give you more accurate information based on your personal circumstances. What is it like to live with one kidney? What is it like to live with one kidney? Most people with one kidney can live a completely normal, active life. In fact, some people are born with just one kidney. Most people are born with two kidneys. You may need to have a kidney removed if you have kidney cancer. This operation is called a nephrectomy. If your other kidney is working properly, then you shouldn’t notice any ill effects – one kidney is enough for your body to function normally. If you have a kidney removed, it’s important to take care of your remaining kidney. This may mean stopping smoking if you smoke, and trying to follow a healthy, balanced diet, rich in fruit and vegetables. Make sure you’re drinking enough fluids to stay hydrated. Try to cut down on the amount of salt in your diet, and the amount of alcohol you drink. These can be linked to kidney damage. Your remaining, single kidney may start to grow larger and heavier than normal, which puts it at greater risk of injury. You may prefer to avoid heavy contact sports or at least protect yourself if you do take part in these sports. Your GP will want to regularly check your blood pressure and test your blood to make sure your kidney is staying healthy. It’s possible to get cancer in both kidneys, although this is rare. If this happens, your surgeon will usually aim to leave part of a kidney to keep your body functioning properly. If you do need both kidneys removed, you will need to have dialysis to filter your blood. Living with kidney cancer -– coping. Cancer Research UK. www.cancerresearchuk.org, last reviewed 24 February 2016.